Summarize Written Text In One Sentence – Read the passage below and summarize it using one sentence (between 5 and 75 words). Type your response in the box at the bottom of the screen. Your response will be judged on the quality of your writing and on how well your response presents the key points in the passage. 1. 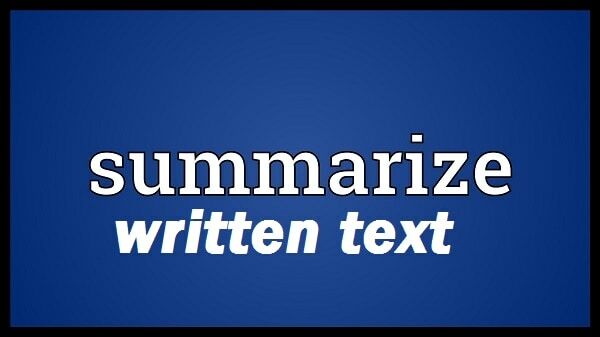 Read and summarize written text in your words. A large new study has found that people who regularly took a siesta were significantly less likely to die of heart disease. “Taking a nap could turn out to be an important weapon in the fight against coronary mortality,” said Dimitrios Trichopoulos of the Harvard School of Public Health in Boston, who led the study published yesterday in the Archives of Internal Medicine. The study of more than 23,000 Greek adults — the biggest and best examination of the subject to date — found that those who regularly took a midday siesta were more than 30 percent less likely to die of heart disease. Other experts said the results are intriguing. Heart disease kills more than 650,000 Americans each year, making it the nation’s No. 1 cause of death. While more research is needed to confirm and explore the findings, there are several ways napping could reduce the risk of heart attacks, experts said. Researchers have long known that countries such as Greece, Italy, and Spain, where people commonly take siestas, have lower rates of heart disease than would be expected. But previous studies that attempted to study the relationship between naps and heart disease have produced mixed results. The new study is first to try to fully account for factors that might confuse the findings, such as physical activity, diet, and other illnesses. Although more research is needed, some studies show that a regular midday siesta could reduce the probability of death caused by heart disease, by helping to deal with stress and biological rhythm of daily living. 2. Read and summarize written text in your words. In a paper to be published in an upcoming issue of Transportation Research Part D, researchers found that drones tend to have carbon dioxide emissions advantages over trucks when the drones don’t have to fly very far to their destinations or when a delivery route has few recipients. Trucks — which can offer environmental benefits by carrying everything from clothes to appliances to furniture in a single trip — become a more climate-friendly alternative when a delivery route has many stops or is farther away from a central warehouse. For small, light packages — a bottle of medicine or a kid’s bathing suit — drones compete especially well. But the carbon benefits erode as the weight of a package increase since these unmanned aerial vehicles have to use additional energy to stay aloft with a heavy load. Share your answer through comments. A new study by transportation engineers revealed that delivering packages via drones instead of trucks reduces Carbon Dioxide emissions, when packages are small and light, but when packages are heavy, drones use more Carbon Dioxide to remain airborne. As per the transportation researchers, packaging deliveries such as trucks are Eco-friendly and better environmental, which carries heavy loads with many stops , as compared to drones with fewer stops and produces lesser co emission, but its erodes with heavy load. Transportation engineers finds that using drone to send small packages to closer destinations, or in a route with few recipients can reduce carbon dioxide emissions, particularly when compared to truck deliveries. Harvard School of Public Health studied the benefits taking siesta through an experiment that involved 23,000 Greek adults, and found that taking regular naps could reduce the risk of heart attacks by thirty percent. Packages, especially small, delivery to nearby location using drones are environment effective solution and helps in reducing carbon dioxide compare to delivery by trucks, however, it’s benefit erode when it is used to delivery heavy loads. From the research, Siesta reduces the death percentage due to heart decease as it helps to reduce stress and maintain biological cycle. Carbon-di-oxide level in the environment will reduce, if alternatives, like drones are used instead of truck when delivery is light weight, near and to few people. A recent study finds that drones are significantly helpful in reducing carbon dioxide emissions when compared with trucks in delivering lighter packages for shorter destinations, however, trucks are helpful in transporting heavy load goods for long distances for more recipients. Although drone parcel deliveries are beneficially minimizing carbon dioxide emissions compared to truck deliveries, the advantages of carbon outweigh when drones use extra energy to carry heavy packages to stay high in the air. The many researchers has discovered that, siesta reduces the risk of heart disease as well as stress of life whereas ignoring mid day sleep really interrupt in the physical activity,dieting pattern and also cause the other illness. A lot of studies have found that taking a nap can help reduce heart disease and improve overall health because it helps to reduce the stress level, and it is also a part of the normal biological rhythm of daily living, however, more research is needed to back this claim. Although delivering packages with drones can reduce Carbon dioxide emissions compared to Truck deliveries, this benefit erodes as the weight of packages increase since the flying machines have to use additional energy to stay flying with a heavy load. Engineers from the University of Washington have found that use of drones for packages delivery instead of trucks are significantly emitting less carbon dioxide when its destination is close and having few recipients. The biggest examination on napping was conducted with 23,000 Greek adults, which confirmed that taking nap helps in getting rid of heart-related diseases and helps to cope with daily living stress because it is linked with the biological rhythm of daily living. Researchers found that drones tend to have carbon dioxide emissions advantages in certain circumstances as compared to truck but these benefits erode when the weight of package increases. The Research team discovered the emissions of carbon dioxide from drones is comparatively more than the emissions produced by the trucks for heavy load transport, yet drones can be still preferred for small & light package transport. 1) The study of more than 23000 greek adults found that those who regularly took a midday siesta were more than 30% less likely to die of heart disease, whilst other experts found that the results were intriguing therefore, napping may help to deal with the stress of daily living. Based on a recent study from University of Washington transportation engineers, drones emit lesser carbon dioxide and become better alternatives to trucks when used for delivering lighter packages to fewer recipients within a short distance from central warehouse. 1) According to the different researcher, heart disease, a leading cause of death can be minimized by taking a nap, which is not only beneficial for cardiac diseases but also reduces the stress of daily living. 2)Although delivering packages with drones reduce carbon dioxide emissions as compared to trucks, trucks are regarded as a climate-friendly alternative as they can carry loads as compared to drones. Researchers discovered that drones might have better advantages in carbon dioxide emissions than trucks for short distant deliveries or when there are only a few stops in the delivery route. People who take siesta regularly are less prone to heart disease as taking a midday nap, the risk of dying from a heart disease is reduced to 30% and this could be the solution to the 650,000 Americans dying of heart disease every year. As per the paper published by Transportation Research Part D, drones can be an alternative to trucks for delivering small packages to nearby destinations but it might increase the use of additional energy to stay aloft. 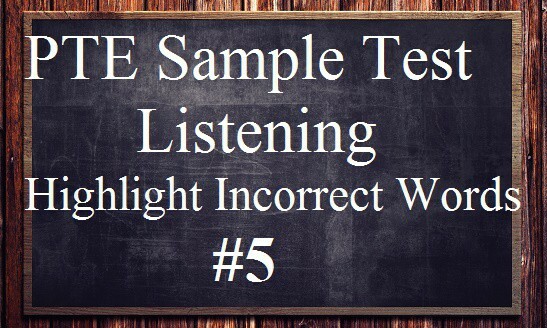 The indefinite article, ‘a’, may be redundant when used with the uncountable noun disease in your sentence. Consider removing it. It appears that you are missing a comma before the coordinating conjunction and in a compound sentence. Consider adding a comma. Transportation researchers came up with an overwhelming innovative idea of replacing trucks with drones for making deliveries in-order to reduce carbon emission, but this mode works well only with low weight packages as trucks have its own cons of delivering heavy load packages in a single trip. A new research on Greek adults inferred that midday siesta helps to reduce heart disease, however the old research differs with mixed results, which argues other external factors to be considered for illuminative results. This sentence appears to consist of two independent clauses. Consider using a semicolon before however. Researchers subjected 23,000 Greek adults and found out that those people who are having a siesta will less likely to die of a heart disease because napping can be used as a weapon to fight coronary mortality, though continuous research is still ongoing. Your sentence seems to be missing a verb after the modal auxiliary verb will. Consider adding a main verb. The indefinite article, a, may be redundant when used with the uncountable noun disease in your sentence. Consider removing it. Researchers found that drones can be more climate friendly option to deliver packages if distance is small, recipients are less and packages are small or light, however, if there are many stops and distance is long trucks will be a better alternative as they will emit less carbon dioxide. The noun phrase ‘distance’ seems to be missing a determiner before it. Consider adding an article. Multiple studies and different institutes believe that an afternoon nap can reduce the chances of heart diseases and this is evident from the fact that in three countries namely, Greece, Italy and Spain there is very low rate of heart disease as people commonly take afternoon nap. The noun phrase afternoon nap seems to be missing a determiner before it. Consider adding an article. Although drones has an advantage of not emitting carbon dioxide while delivering small packages, trucks can carry more number of packages from small to big sizes and can deliver with many stops. The singular verb ‘has’ does not appear to agree with the plural subject ‘drones’. Consider changing the verb form for subject-verb agreement. Delivering packages using the drones helps in reducing carbon dioxide emissions but in the upcoming research shows using trucks compared to the drones will be climate friendly if the delivery routes have many stops and the delivery van carrying heavy appliances. Although researcher know that napping reduces the heart diseases, the recent study about relationship between naps and heart disease shows the mixed result which takes in account physical activity, diet and other illnesses. The plural verb ‘know’ does not appear to agree with the singular subject researcher. Consider changing the verb form for subject-verb agreement. It appears that the preposition ‘in’ may be incorrect or unnecessary in this context. Consider changing or removing it. According to expert’s new study from more than 23,00 Greek adults, people who took regular midday siesta were more than 30 percent less likely to suffer from heart related diseases and it has many health benefits such as, reducing the risk of heart attacks which is major cause of death in America each year. According to new study from University of Washington transportation engineers, drones can be used for delivering small, light packages with smaller distance and few recipients whereas, trucks – which can offer environmental benefits by carrying large household materials to longer distances. Any comment on this summery!!!! It appears that ‘heart related’ is missing a hyphen. Consider adding the hyphen(s). In a research paper published by University of Washington, Drones have proved to be more environmental friendly for delivering small packages at short distances, while trucks are best for larger distances or large loads or deliveries requiring many stops. Experiment performed on 23000 greek adults by Dimitrios Trichopulos of Hardvard suggest that taking mid- day nap reduces the risk of heart diseases, which kills around 650000 americans every year, while other say it has lot of potential but require further study. A small midday nap could potentially lower’s the cardiac related diseases, as per the study it was concluded that people of some European countries have low chances of heart diseases as their average napping is more than other nations; however previous study has found mixed reasons on heart diseases. Although, research shows that taking a nap and having a midday siesta help mitigate the risk of heart diseases and death but the new study made, is first to try to fully account for factors that might confuse the findings, such as physical activity, diet, and other illnesses. A new study from the University of Washington transportation Engineers, finds that the use of drones have less carbon-dioxide emission compared to the use of trucks. A new study from the University of Washington transportation Engineers, finds that the use of drones in delivering packages have less carbon-dioxide emission compared to the use of trucks. Delivering packages with drones as compared to trucks are more beneficial because of less carbon dioxide emissions, according to new study but for heavy loads and far distances trucks are helpful and environment friendly. A new study from University of Washington transportation engineers found that drones which reduce the carbon dioxide emissions in certain circumstances while delivering small and light packages as compared to truck deliveries but truck is more climate-friendly alternative when a delivery route has many stops. Delivering packages with drones can reduce carbon dioxide emissions in certain circumstances as compared to truck deliveries,however, the carbon benefits erode as the weight of a package increase since these unmanned aerial vehicles have to use additional energy to stay aloft with a heavy load. A new study shows that the drones could be an effective mode of transport for short destinations with few drops whereas trucks are more beneficial for longer distances with frequent stops with respect to carbon dioxide emissions. Package delivery with drones can reduce Carbon dioxide emission if they don’t have to fly very far or have few recipients and lighter package load as compared to truck deliveries but trucks can be more climate-friendly if the mentioned scenarios are opposite. Drones outweigh trucks when the delivery package is small, light weight, with less stops and closer destinations and reduce harmful gas emissions but trucks serve better when the package is heavy and need to be delivered far from the factory due to less energy consumption. A new research about heart disease conducted among more than 23,000 Greek adults has found that a person taking siesta regularly are less prone to heart disease; however some people do not seem to be convinced with this theory. Although the rate of carbon emission is less with the package delivery via drones , they are not suitable for the long distance and large number of recipients in comparison to trucks which can carry variety of goods to wide range. Findings of a study of Greek adults have suggested that people who took regular midday naps were less likely to succumb to heart diseases, with a few experts arguing a possibility that napping may help with the stress and biological rhythm of daily living and though this has opened up a space for further research, many of them have produced mixed results. A new study has suggested that in case of deliveries with lower travel distance and load, drones have proven advantageous over trucks since they reduce carbon dioxide emissions which however means that for farther destinations and heavy load, trucks will be a climate friendly alternative since drones will need additional energy for the same delivery thereby eroding carbon benefits. The people have very few health diseases who frequently took a siesta, which help us to fight against coronary mortality,relieve from the stress and will have more health benefits which was the part of our biological system. A study done by the transportation engineers of The University of Washington has revealed that for the short distances with less recipients in the way, drones are a better alternative of trucks in the terms of carbon emission but it can only be advantageous if the package is light weight. A study of 23000 Greek adults has revealed that the chances of heart disease, which is the number one reason of death in America by killing 65000 Americans each year, can be be reduced by 30% only if a person follows the biological clock particularly by having a nap in the midday despite the study needs further research. however, a new research study suggest that it could be true since it was able account factors such as physical activity, diet, and other illnesses. A new study finds that drones could be helpful in reducing carbon dioxide emissions, by delivering smaller packages to shorter distance, however trucks become environment friendly alternative and can be used as multipurpose vehicle to carry large and heavy objects to longer distance. A study from the University of Washington transportation engineers says that deliveries can be routed by using drones which has lesser carbon dioxide emission and environment-friendly effects compared to delivery by trucks but is limited to small valued or light items in order to float in the air. Unmanned aerial vehicle reduce the carbon dioxide emission in many circumstances, where the package is smaller and lighter, but carbon benefits erode as trucks becomes more climate friendly alternative when a delivery route have many stopes or far away from central warehouse. As per some research, delivering packages using drones can reduce carbon dioxide footprints in comparison to deliveries done using truck, simply because drones need not to fly far from the destination, however, trucks can prove to be environmentally friendly in comparison where there is a need to carry more stuff, with multiple stops and to far off places. As per various studies and continues researches have proved that, about 30% less people are likely to die of heart disease than who do not take Siesta everyday. Researchers said people who take the siesta, they have less chance of heart disease and it takes in some countries such as Greece, Italy and Spain to lower rate of heart disease. Transportation engineers found that delivering packages with drones decreases the carbon emission rather than using Trucks but Drones are suitable for transporting small light packages where as Trucks are suitable for heavy and sensitive packages like home appliances, furniture etc. According to a study, many deaths are occurring due to heart diseases and taking Siesta or a Nap is one of the good solution to prevent it as per many researches conducted across the world and it is proved that people taking Nap after lunch have low risk of getting heart diseases. New study has found out that people who regularly took a midday siesta were 30 percent less likely to suffer and die with heart illness but further study are still needed to confirm it and other factors like dieting, physical activities etc. that might confuse the findings must first be accounted. Please review author. Thank you! Drones are eco-friendly than trucks while delivering the light weight goods in short distances, in contrast prefer trucks to carry heavy goods for longer distance. As per the study from University of Washington transportation engineers, making use of drone delivery help reducing carbon dioxide emissions for relatively small type of items on same route, whereas trucks are environment friendly to deliver heavy items for long distance with multiple stops. Package deliveries using drones are beneficial for the environment when the destination is near and if the package is small and light, while trucks offer more benefits by carrying everything on a single trip especially when the route has many stops or is farther from the warehouse. Although, aerial vehicle reduce carbon dioxide emissions, and deliver small packages effectively, to become more climate-friendly like trucks these drones need to use additional energy to fly with a heavy load. In the new study found that drons reduce carbon dioxide emission more than truck delivery but truck has helped to maintain environment by carrying everything from clothes to appliances to furniture in a single trip and it has no many stops compare with alternative delivery mode. It has been found that siesta could reduce the chances of heart diseases and the daily stress of routine life, reasons could be biological but napping has proven to be very beneficial for healthy mind and body. On the basis of studies done in different countries, some researchers, with the mixed reviews and confusing findings; believe that an afternoon nap has several benefits like preventing possibilities of heart disease, improving physical mechanism, curing coronary mortality and reducing stress and anxiety. As per the findings, drones are more environmental friendly compared to trucks in terms of delivering light packages in nearby areas and to few customers; as it emits less carbon dioxide, while trucks are more useful in delivering variety of products in a single trip having more stops and far routes. Studies found that trucks are effective for longer distance transportation of heavier goods to multiple locations, whereas drones provide more nature friendly transportation of lighter goods to a shorter distance, by reducing the emission of carbon dioxide gases. The study has showed that a little siesta, a little snooze or a short nap has always been beneficial in significantly decreasing the heart attacks and some other disease which has killed 650,000 Americans each year, making it the nation’s No. 1 cause of death. Although, there were there studies including that were performed on the Greek adults confirms the fact that midday naps reduces the chances of death due to coronary disease, yet there are significant medical research need to be conducted to prove this fact. Although, there were there studies conducted on various countries confirms the fact that midday naps reduces the chances of mortality due to coronary disease, by relieving stress, yet there are more medical research need to be conducted to prove this fact, by considering food habits, physical activities and other health issues of individuals. In a paper published from University of Washington transportation, delivering packages with drones carry advantages over trucks;drones reduce carbon dioxide emissions in certain circumstances as compared to truck deliveries whereas trucks offers environmental benefits when a delivery route has many stops. In the research conducted by University of Washington, reports that drones have advantages of less emission of carbon dioxide over trucks, when the delivery is small and many recipients are on same route, but results totally change, when the delivery has more weight, the more carbon dioxide emits from the drone. Although more research is needed, some studies show that a regular midday siesta could reduce the probability of death caused by heart disease up to 30 percent, and napping also helps to deal with the stress and biological rhythm of daily living. Researchers have agreed that delivering packages through drones can help to decline carbondioxide emissions in certain situation whereas delivering through a truck is also detrimental in a circumstances where the delivery route have many stops . Several researchers have demystified the matter of taking little siesta which is very beneficial to deal with the stress of daily living; it is proved that those people who take siestas have lower chances of getting heart disease. Please share your feedback on. In a research paper it is published that it’s better to use drones for delivery of small, light packages if destination is not far and delivery routes has few recipients because drones emits less carbon dioxide, however, if the package is heavy and delivery route has many spots and farther away from a central warehouse, truck would be the better option as drones requires additional energy to stay aloft with a heavy load. Upcoming paper in the Transportation Research has compared Drones and Trucks in terms of reducing environmental damages caused by their harmful emissions; on one hand drones are beneficial in reducing carbon footprint for short distances and limited numbers of drops, whereas on the other hand trucks are still a better choice for long distance deliveries with higher number of stops. 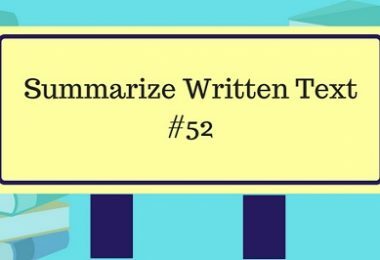 – The wide range of vocabulary, good use of grammar, content covers almost everything. A recent study published in Internal Medicine into over 23,000 Greek subjects, has proved that taking an afternoon nap reduces chances of heart attacks by 30% in adults; however, more comprehensive research is required on this subject considering the aspect of dietary habits, physical fitness, and existing health issues. Drones can help to reduce the carbon dioxide emission as compared to truck deliveries while delivering packages but they can carry light weight packages only as carbon benefits erode as the weight of package increases. Otherwise good, try to include points regarding truck deliveries also. Siesta could reduce the chances of heart attack in humans and along with that napping also helps to deal with the stress of daily living. Overall good, but you can include few more points. The research carried out among Greek people showed that those who regularly took a siesta were not highly prone to heart disease; however, this study yet needs to research on the factors to validate the findings. According to various research in medical science, taking a daily nap helps to reduce the stress which in turn minimises the risk of heart ailments which is a major cause of deaths in America, however new studies say that other factors like diet and physical activities should also be taken into consideration in order to establish this finding. In order to reduce the carbon emission, drones proved to be more beneficial than trucks for carrying lighter good at a shorter distance, however if the distance is more, goods are heavy and number of recipients is higher then trucks definitely have a winning edge over drones. Drones are more beneficial than heavy transport like trucks , when light weight packages need to be delivered on short distance therefore transportation engineer from the University of Washington developed study case to prove , how carbon dioxide emission can be reduced? Drones are an environmentally friendly transportation option when the delivery location is not too far and the load is light, whereas trucks are more suitable when there are heavy loads to be delivered at distant locations with multiple deliveries on the same route. According to latest research, an afternoon nap can reduce risk of heart attack by more than thirty percent, which is also supported by the facts that one of the biological cycle of our body dips in early afternoon demanding for rest and an afternoon siesta is tradition in many countries, yet more research is needed to establish this finding . carbon dioxide emission by drones and trucks can be reduced depending on the distance traveled and the weight of goods being delivered. To reduce carbon dioxide emissions, delivering light packages with drones compete especially well but don’t fly very far destinations, where trucks can deliver packages in single trip. Author please correct it, if I have done any mistakes. According to the latest study, siesta can be helpful in reducing the chances of heart diseases by 30 percent by reducing the individual stress level, yet more research is needed to support the findings. Hi! Is this not two sentences? Thank you. The carbon dioxide emission can be reduced by the use of drones for delivering light weight items over short distances however, for heavy items and for comparatively distant destinations truck will remain the only available option. As per the studies, nap may help to deal with the stress and who takes midday siesta were more than 30 percent likely to be die of heart disease, but other findings shown mixed results. A new study has revealed that drones emit less carbon dioxide and is suitable for a shorter trip, whereas trucks can still be considered the environment- friendly in the case of long distance trip with the heavy load. I think the text about “Napping” is really long and does not resemble questions of PTE. 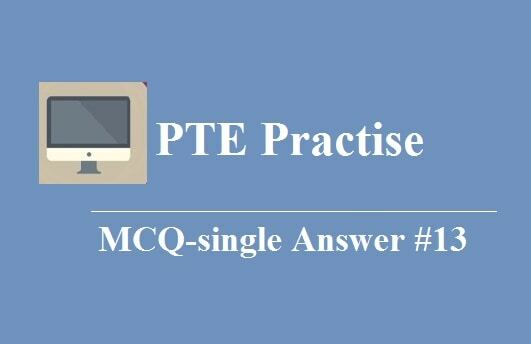 Is it really a repeated question from PTE? These questions are quite similar to what students received in their exam. Generally, the SWT paragraphs are of 300- 320 words. Siesta helps in fighting with diseases and lowers chances of having a heart disease by 30 percent, moreover, neglecting these naps could result in disruption of some biological processes, yet more research is needed to confirm the findings. After comparing trucks and drones on the basis on carbon dioxide emissions, research reveals that drones are only effective in reducing carbon dioxide emissions if delivery packages are light, distances are shorter and recipients on route are less. A new study which takes into account physical activity, diet and other illnesses, suggests that taking nap in the afternoon helps in dealing with stress and thus effective in reducing the probability of heart attacks; this study however needs more reasearch. Researches show that drones are the best alternative for smaller goods delivery to short distances while emitting the less carbon dioxide than trucks, which are friendly to the environment in delivering large goods across long distances. The biggest scientific survey has revealed that afternoon nap is the effective way to reduce the chances of heart diseases, but more studies are required to find the other ways how exactly it works. Study has shown that drones are best companion for delivering small packages to a shorter distance with less carbon dioxide emissions, but still trucks are more beneficial for long distance, as they can carry lot of stuff in one go , without using any extra energy.